A grandmother and granddaughter baking together in the kitchen. 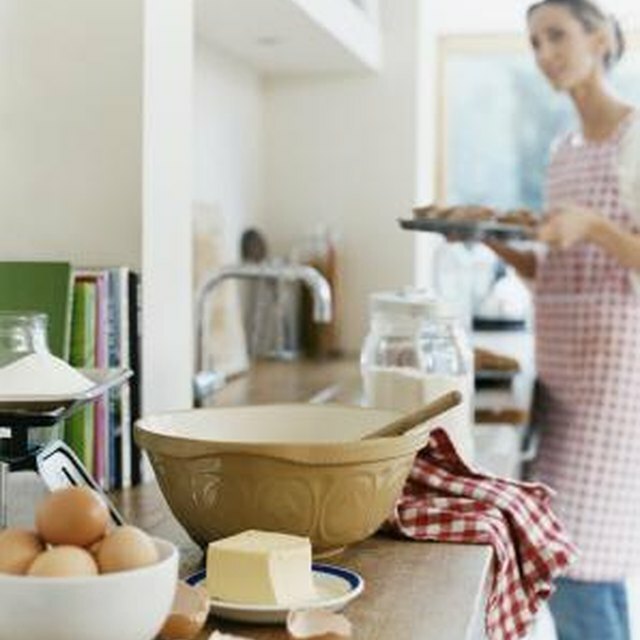 People with a lactose or casein intolerance, as well as those who don't consume animal products, must use dairy-free substitutes for milk and cream when baking. An adequate substitute for sweetened condensed milk often leaves cooks stumped, because the product is used to both sweeten and add creaminess to desserts. In some cases, your milk substitute may also act as a sweetener, while in other recipes you’ll need an additional sweetener. Many traditional recipes contain both sweetened condensed milk and sugar. When using an unsweetened milk alternative, increase the amount of white or brown sugar in your recipe. Alternatively, combine the milk substitute and sugar, and condense it yourself before adding it to the recipe. Combine 3 cups plain almond, soy or rice milk and 1/2 cup white sugar and reduce the mixture on the stove to 1 cup. Add a pinch of salt and vanilla extract. Soy, rice and almond milks come in plain and flavored varieties. To substitute for sweetened condensed milk when baking, use a sweetened vanilla-flavored milk substitute for pumpkin pie and layer bars, and sweetened chocolate or vanilla milk substitute for puddings, brownies and cookies. Reduce the milk substitute on the stove top to intensify the liquid’s natural creaminess and sweetness. When the liquid thickens enough to resemble sweetened condensed milk, remove from the stove, cool and add the same amount of the liquid called for in the recipe. Combine tofu with honey to create an ingredient similar to sweetened condensed milk. Use three parts tofu to one part honey, and combine in a blender. Substitute the same amount of the tofu-honey mixture for the amount of sweetened condensed milk used in the regular recipe. If you dislike using animal products, substitute agave syrup for honey when blending a sweetener with tofu. The syrup is derived from the Mexican agave plant. Agave nectar or syrup can substitute for honey or maple syrup. Casein-free advocate Beth Kevles’ collection of dairy-free pumpkin pie recipes includes one that uses maple syrup as the sweetener. Use a two to one ratio of milk substitute to maple syrup. Apple butter adds sweetness and density to fruit-based desserts like pumpkin pie. As with maple syrup, use about half as much apple butter as you do the milk substitute. Blend chopped dates, cashews, vanilla and water to approximate the sweetness and consistency of sweetened condensed milk in pie and layer bar recipes. One recipe in Kevles' pumpkin pie collection uses 1 1/2 cup chopped dates, 1 1/4 cup water, 1 cup cashews, and 1 tsp. vanilla, along with spices.